Shoes are a critical, but surprisingly overlooked part of your golf game. 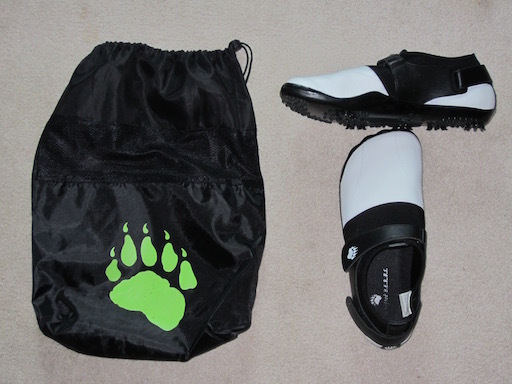 I recently got a pair of Barefoot BERBS golf shoes and I think they fix several critical problems that most other golf shoes have. How many times have you felt lined up correctly, but then as soon as you went to swing the club you felt completely out of balance and wound up topping or chunking the ball? It could be your shoes rather than your swing that are to blame. When you swing a golf club you put a tremendous amount of angular force through the soles of your feet as your weight gets transferred from one side of your body to the other. Flat soles – Zero heel-to-toe drop. In other words, no raised heel. Does standing on an uphill or downhill decline make your swing easier or harder? Harder of course. You don’t want a decline built into your shoes. Minimal soles – The thinner the sole the better. This puts you into closer contact with the ground and contributes to lateral stability. Wide toe box – Feet are naturally widest at the toes, not the ball of the foot. Allowing toes to splay over their natural range of motion helps lateral stability. How many conventional golf shoes fit these criteria? None. In fact, they are typically designed the exact opposite–with raised heels and a narrow, pointed toe box. You might as well try to play golf in a pair of pumps. I had been wanting to try the Barefoot BERBS for a few years now, and I have to say that they are everything I hoped they would be. I shot a lifetime best at my neighborhood course on my second outing with them. Before I got my B.E.R.B.S. I was endlessly frustrated by all the swing compensations I had to do because of the heels in my golf shoes. I often wound up just wearing flats, which was not ideal since they didn’t have the added traction of spikes and were slippery on wet grass. With the BERBS on I never felt out of balance, and I feel like it helped bring a higher level of consistency to my long game. When your shoes stop working against you and allow your feet to move naturally, that’s just one less thing you have to think about during the golf swing. The adjustable velcro strap and stretchy neoprene saddle on the upper also enable an easy snug fit. The only real negative to these shoes is the leather strip that runs up the back of the heel along your Achilles tendon. You know that feeling of leather dress shoes cutting into the back of your ankles? That’s what I’m talking about. You will need to tape Doctor Scholl’s Moleskin to the inside of the heels or get some blister pads or you won’t even make it through the front 9 without significant discomfort. But once that is handled, it’s smooth sailing. I highly recommend Barefoot B.E.R.B.S. golf shoes. 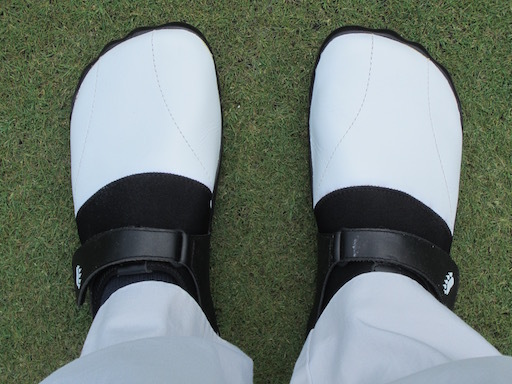 Given what to me, as an avid biomechanist, are the obvious advantages of the zero drop, wide toe box “barefoot” design, I’m amazed that the entire PGA Tour hasn’t been outfitted with these yet. No matter how well you think your current golf shoes fit, the raised-heel, pointed-toe design is working against you. As I mentioned earlier, the only minor quibble I have with these is that you just need to make sure to apply some Doctor Scholl’s Moleskin to the inside of your shoe heels or take other precautions to protect the back of your ankles. However, at only $69, there is really no reason not to try them. There is no other piece of golf equipment where you can literally buy your way to a better golf game for so little of an investment. You can purchase your pair at www.barefootberbs.com. Previous post: Is The Paleo Diet Still Relevant?